MotoGP is the premier motorcycle racing World Championship; an eighteen-race series visiting fourteen countries, four continents and with pan-global television coverage. Ten nationalities of the world’s most skilled riders line a grid armed with cutting-edge motorcycle technology with prototype machinery fielded by 5 manufacturers; Aprilia, Ducati, Honda, Suzuki and Yamaha. MotoGP has a rich history with Grand Prix events having taken place in every corner of the world throughout the last 66 years. Italy, Great Britain, Spain, the USA and Australia are just some of the nationalities that have all totaled high numbers in terms of race victories and world titles. As well as the premier class there are also two ultra-competitive World Championship Grand Prix categories, which form part of ‘MotoGP. 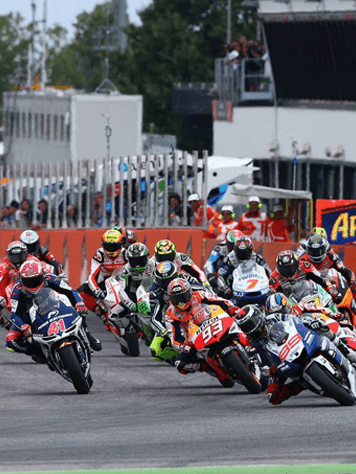 The Moto3 (formerly 125cc) and Moto2 (formerly 250cc) World Championships have their own races at each Grand Prix, meaning that by the end of the season three champions are crowned.